Anyone who has ever been fishing, even once, knows exactly why it’s called ‘fishing’ and not ‘catching’. The sport of fishing doesn’t always include getting a fish in the boat and although no one can realistically promise you a trophy fish, we can dramatically raise the odds. The Boundary Waters is our backyard and we know the local lakes better than most. We are well versed in the history, native animals, and of course the best kept secrets of Ely and Boundary Waters fishing. When you choose our Guided Fishing Services in Ely, you’ll catch a lot more than Bass, Walleye, Pike, Trout or the Crappies you seek; you’ll be immersed in the history, captivated by the land and inspired by the tales our seasoned and licensed Ely Fishing Guides have to offer. Come to Moose Track Adventures for the amazing guided fishing and you won’t be disappointed. In fact, you’ll be back. Our Professional Ely Guide Services are available as a motor boat guided trip or in a canoe, the choice is entirely up to you. But please keep in mind there are horsepower restrictions on many of the lakes. 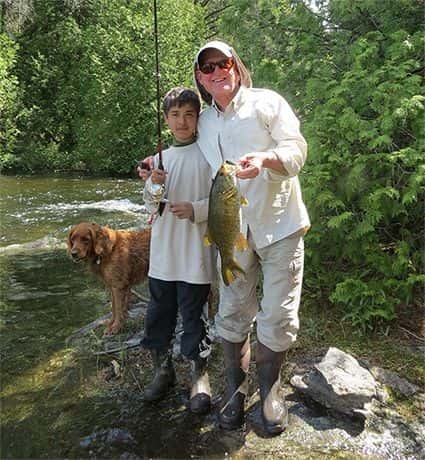 The fishing guide services provided by Moose Track Adventures are great for all ages. 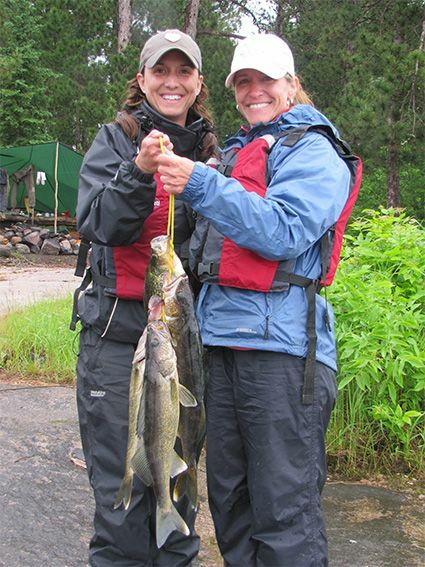 Ely, Minnesota’s Professional Fishing Guide Service at Moose Track Adventures offers guided Ely MN fishing and fly fishing trips for Walleye, Northern Pike and Smallmouth Bass in the Boundary Waters Canoe Area Wilderness and surrounding Ely lakes. The Boundary Waters Canoe Area Wilderness & Ely MN offers world class fishing for fish, including Smallmouth Bass, Walleye, Northern Pike, Lake Trout and Crappies. Our United States Forest Licensed Guide Service offers a variety of guided Ely MN fishing trips for all ages, so while you’re in Ely treat yourself to a full or half day of guided fishing in one of our guide boats or canoe and learn the hot spots and methods of catching fish from a professional. BWCA Basswood Lake Guided Fishing Trip – If you’re looking for a daytrip on the famous Northern Minnesota Basswood Lake and want heighten your chances of producing fish, our guides can do just that. Be sure you have a permit well before your arrival date by calling us – we can make this process seamless for you. The Basswood Guided Tour also includes us supplying the bait, boat, gas, life vests and even the rods if you request them in advanced. BWCA Remote Lakes Guide – Do you have more of a remote lake destination in the Boundary Waters area in mind? We can help you plan, arrive, and even bait for your ideal Boundary Waters Fishing Trip experience. The more time you have, the more remote you can get. Regardless if you have a lake picked out or would like our personal opinion in choosing a lake – Moose Track Adventures has some of the best fishing guides in Ely. Ely Area Lake Guided Trips – Are you looking to catch a Black Crappie, feel the fight of a Sucker, test your strategy on Trout, or devour some of the tastiest Walleye around? Or perhaps you’re checking all of the 21 native fish species off your list? Either way, we can offer our expert assistance to be sure you get what you want out of your Boundary Waters Trip in Ely. White Iron Chain of Lakes Fishing Guide – The White Iron Chain of Lakes near Ely Minnesota is made up of four interconnected lakes: White Iron Lake, Farm Lake, Garden Lake, and South Farm Lake. All but one of these lakes have no motor restrictions, with the exception of South Farm Lake – which has a 25HP motor limit and requires a permit. Our White Iron Chain of Lakes Fishing Guide option will greatly enhance and allow for a stress and guess-free time on these great fishing lakes in Northern Minnesota. Ultimate Cast & Blast Fishing Guide – This guided trip has been developed for the serious fishers. Two full days of fishing for the Boundary Waters’ finest. We can map out an area for your specific requests or you can choose the lakes. With either option it is important to have a plan set early because many times a permit is required. And for the long days on the lake be sure to ask about our shore lunches, they come highly recommended and are $25 well spent! Whether you are planning a trip for next year or you’re just not having any luck on your current trip up to Ely. If you want a skilled local guide to help you change the odds and add some excitement, Moose Track Adventures will do everything we can to accommodate your requests. One of our five seasoned guides can take you out on a lake trip you are sure to never forget, our vast Boundary Waters and Quetico knowledge and experience will give you a new insight into this beautiful land. There is an abundance of fish to be found in the Boundary Waters. Increase the amount of amazing opportunities you experience in Northern Minnesota with the help of our Licensed Boundary Waters Fishing Guides. For Ely and Boundary Water Guided Fishing Trips contact Moose Track Adventures at 218-365-4106. We are also a Boundary Waters Outfitter, so if you need more than what our packages offer, speak up and we can surely provide.